Something was off in paradise. It took us a couple of days to put our finger on what it was that felt so odd about the place. It was truly beautiful, so what was amiss? It was so peaceful, so utterly silent. And then it hit us—it was too silent: non c’erano uccelli! There were no birds! Not a single bird to be seen or heard! It was the strangest thing. Never before had we awoken to a morning completely devoid of birdsong—not even in any city we’d ever lived in or visited. There were birds aplenty in all the Italian cities and towns we visited. But in the countryside of Umbria, the birds were gone. The short explanation is that songbirds have historically been hunted there and throughout the Mediterranean. We learned later that there is a growing movement afoot to try to rectify that. Many small groves of sunflower patches have been planted throughout the forests in an effort to attract more birds back. So, while everything else about our Italian villa was utterly perfect, we couldn’t quite call it paradise—because our idea of paradise must include gli uccelli, the birds, one of nature’s sweetest gifts to us and this beautiful planet. House Sparrows (photograph by Lip Kee Yap). Thank Goodness for City Birds! According to a study cited in a recent blog post by Andrea Alfano from Cornell Lab of Ornithology, major cities around the world are home to some 2,041 bird species—making up 20 percent of all known bird species. And thank goodness for that! Since our experience in the song-less forests of Italy, our already high appreciation for all birds increased dramatically, but perhaps even more so for those birds willing to cohabit with us city dwellers. Intrigued by that statistic, I decided to take an inventory of the birds I regularly see in my neck of this high-density downtown Calgary neighborhood. While I’m not a serious birder, I do enjoy keeping my eyes peeled for birds wherever I am, and I particularly enjoy trying to identify any birds we happen to see or hear. A juvenile fledgling robin with a speckled breast. I once saw them described somewhere as having an “adorably grumpy and somewhat baffled look” which, happily, they grow out of (photograph by Arthur Chapman). Robins are arguably my favourite bird, perhaps because, for me, their song is inextricably linked to a treasure trove of happy childhood memories—memories of being serenaded at dawn and again at dusk every spring. With life changing so fast these days, there is something so comforting about hearing the same song I heard as a child—one that resonated so deeply with me, even then. To this day, the robin’s song instantly touches something deep and joyful and comforting inside of me. I remain ever appreciative that these beautiful birds make our city boulevards and yards and neighborhood parks their home every spring. Click here to hear the American Robin’s beautiful song. I know that the ubiquitous House Sparrow seems like such a boring little bird to most. Often described as “distinctively drab”, they are easy to dismiss as simply another “little brown job”. But that’s not my take on them. I think they are handsome little birds. And I particularly appreciate them for the true city birds that they are, living as they do all year-round in our city. Were it not for them, I would not hear such a happy chirping chorus everywhere I go, no matter the season. Unperturbed by any extremes of weather, these rowdy and robust little birds chatter and chirp all day long, whether it is a frigidly cold snowy day in winter or a sweltering hot summer’s day. Somehow they have not only adapted to city life, they have thrived here. I’m so happy they have chosen to live in our cities. The House Finch is another favourite summer bird. They are a relatively recent addition to our neighbourhood in the last ten years or so. Their distinctive, happy, warbling song serenades our whole neighborhood, beginning as soon as they arrive in mid-April and continuing through until early July. Click here for an audio sample of the House Finch Song. The House Finch song in our neighborhood is a bit sweeter, slightly more intricate, and not as “scratchy” sounding as this recording, but this gives one a good idea of their beautiful song. These adorable, curious and very social little birds never fail to make me smile. I often hear their beautiful, resonant two-note song ringing high and clear above the fray and din of city sounds. Happily, these sweet birds live with us year-round. And what a joy when one comes and lands on our hands (see: Little Birds Feeding From My Hand). Click here to hear the Black-capped Chickadee’s typical two-note song. 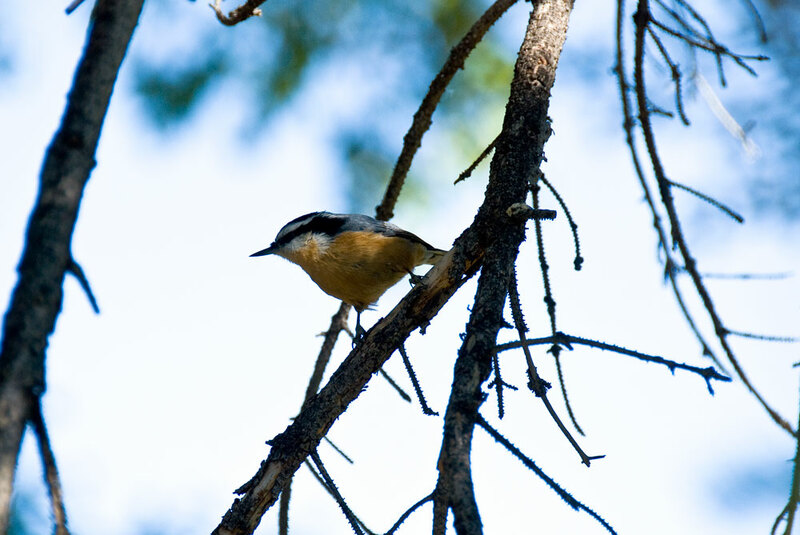 Another year-round bird, Red-breasted Nuthatches are always a joy to see and it is so delightful to have one alight upon our outstretched hands (see: Little Birds Feeding From My Hand). Below is a quick shot I got of a regular winter visitor to our balcony. This beautiful, inquisitive woodpecker loves to stop by for some of the fresh, unsalted peanuts in the shell we put out in the winter. 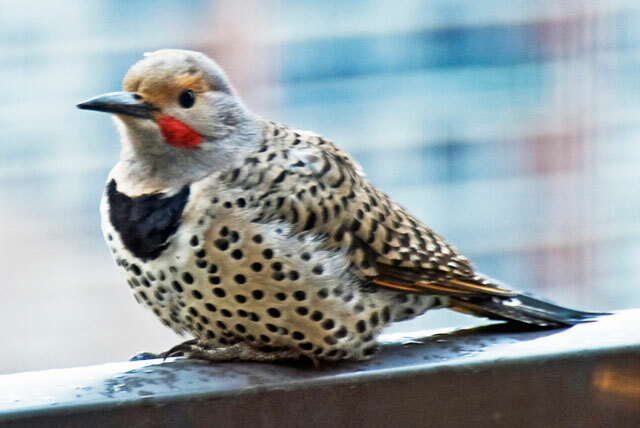 Northern Flickers are here all year, but once the insects come out, they no longer come round for peanuts. Instead, we often seen them on the ground hunting for ants (one of their favourite summertime meals). Don’t you just love their markings? Isn’t it wonderful that some birds like to float on water? 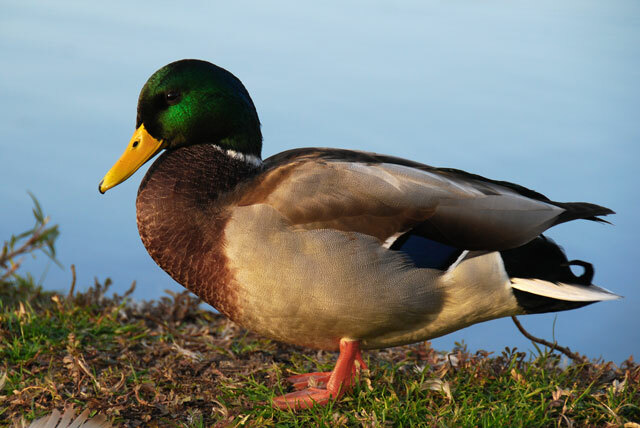 Mallards are common in our city park ponds and familiarity makes it easy to overlook their beauty. But, common or not, if one really takes the time to look, one cannot deny the splendor of their gorgeous iridescent plumage. It never fails to catch my appreciative eye. Male mallard posing for me at Prince’s Island Park, Calgary (photograph by madlyinlovewithlife). It just wouldn’t feel like spring without seeing all these adorable yellow fuzz balls—Canada Goose goslings at Prince’s Island Park. Magpies are part of the very intelligent and entertaining bird family known as corvids. These guys also love unsalted peanuts in the shell and they love to stop by our balcony for a few in the winter time, particularly on very cold days. They are fun to watch because they always take time to lift and drop every single peanut, weighing each of them to ensure they pick the biggest and heaviest ones first. They are curious birds—they love to search our flower pots for hidden peanuts and love to cache their finds elsewhere on our balcony. 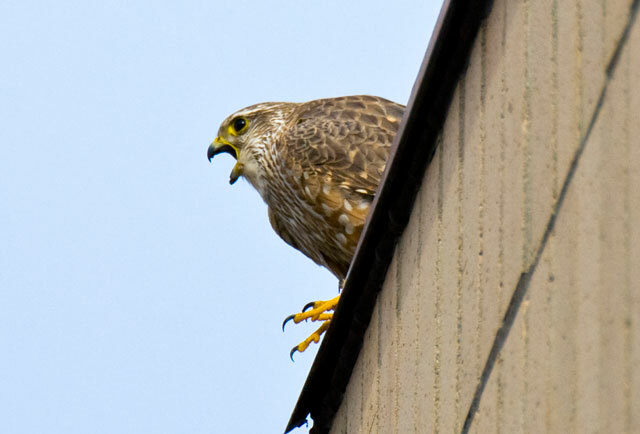 Occasionally, different birds will use our rooftop as a perch. This Merlin was calling to a prospective mate. Merlin perched on our rooftop (photograph by madlyinlovewithlife). And what a treat when, on two occasions, a Great Horned Owl landed on our rooftop at dusk, peering back at us with those amazing yellow eyes! Several times a year, we serendipitously spot a Bald Eagle soaring right past our window or gliding high above us in ever-widening circles, white tail feathers back-lit by the sun, as it catches an updraft. It’s always a breathtaking and glorious sight. And what thriving city would be complete without a wide array of beautiful City Chicks? Thank you so much for your gracious comment, Takami. Like you, I think there is beauty and great value in every bird. I feel the same way about all living creatures, big and small (as I suspect you do too). And, no, I definitely do not at all think it strange that you find crows beautiful. My partner and I both LOVE crows. We are completely fascinated by both their beauty and their intelligence. Since you appreciate crows, I know you’d love the PBS documentary, “A Murder of Crows”. If you ever get a chance to see it, I think you would find it absolutely fascinating. Our crows are probably smaller than your crows, but our ravens are quite large. For an extremely interesting, entertaining and insightful study of the raven’s intelligence, check out the book “Mind of the Raven”, by biologist Bernd Heinrich. I totally agree that crows make a wonderful photographic subject and I look forward to seeing some of your beautiful Japanese crows. You may already be aware, but there was another touching documentary on PBS called My Life as a Turkey (http://www.dailymotion.com/video/xvccpd_my-life-as-a-turkey-hd_shortfilms). My husband & I both loved it. It was unbelievable to learn there were no birds to be heard… Amazing! I hope their attempts to repopulate succeed. The US did something similar in Yellowstone with wolves. It has proven to be a huge success. You are blessed with such a variety where you live. When you came to SoCal, did you notice but a small variety? And the recordings of especially the robin was superific… We’re waiting for more of your patented “wildlife in hand” captures, Jeannie! Koji, we were so busy when we visited Greater Los Angeles (also it was cold and rainy for part of it, not to mention we spent a good amount of time driving the freeways too.. Ha..ha..) that I can’t say we were able to identify any specific birds, but we both remember seeing and hearing them. :)) We do recall seeing sparrows, different kinds of gulls and pelicans. Amazing post! You know lots more about birds than I. Today I was trying to identify the bird who made a nest in our hedge. I am trying to get a good look when he is around warning me to stay away. I think I would enjoy Umbria even if I couldn’t hear a bird ! You description is making me dream …thanks. It can take me a while to identify a new bird too! Beautifully descriptive writing my friend. I’m right there with ya on the Tuscan landscape. I could smell and see it as I read. Your experience reminds me of one I had in Shanghai–same thing–no birds. I guess you’d expect it in a city with a gazillion million people but like you say, not even in the city do you miss the sound of the birds. I figure it was just like you said, the locals are eating them. To each his own I guess but I prefer the melody of a bird over meat on the plate. Thanks for your kind words, David–you are always so gracious. And I’m with you: it would never be my choice, but as you said, to each his own.